”In February 2018, a team of young Nepali engineers successfully conducted a drone delivery test over a one-kilometer distance outside Kathmandu, the Nepali capital. For the past months, these engineers have been building a fully autonomous drone capable of delivering medical supplies to remote parts of Nepal where life-saving drugs are difficult to transport, especially during emergency. As stated in my previous post, we ought to identify and encourage local talent from far-flung regions across the world to help democratize AI. 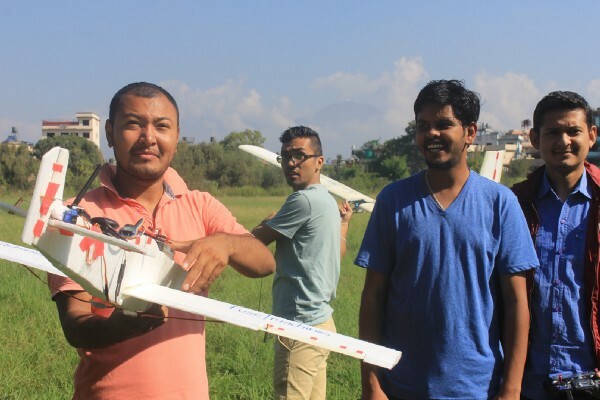 What these young engineers are achieving in Nepal is a small step toward that vision, where Fusemachines has provided necessary resources and training to build an advanced drone prototype. The drone delivery project began in July. When Anish Joshi, the director of technology for Fusemachines, and I were working on self-driving vehicles, we asked ourselves what could be the best use case for an AI technology in a country like Nepal where 80% of the population lives in rural areas? Given the need for better infrastructure, especially in the healthcare sector, we thought a flying “health post” that can overcome the country’s mountainous terrain could help save thousands of lives. The original team was made of four software engineers, including the project lead, Rojesh, who began as one of our inaugural AI fellows. Last year, he expressed his desire to design a long-range autonomous drone. We put together a team of software engineers and programmers. Soon, the drone project was launched. They faced many technical obstacles, some of those required advanced knowledge in drone building and configuring auto-navigation. There were many points in the last months where our engineers had to face frustrations, but they persevered, knowing that the end goal was bigger than the project itself. Over the months, senior engineers assisted them in honing their skills. After multiple iterations and test flights, the team now has a working aircraft prototype that can effectively deliver packages within a certain distance. A few weeks ago, the drone successfully performed a one-kilometer autonomous flight with GPS-based delivery. The next step for the Fusemachines drone team is to build a prototype that can carry out long-distance high-altitude delivery. Not only are we proud of the work accomplished but we also believe it proves this sort of initiatives can be carried out successfully by relying on local resources and talents. With the rising demand for AI software engineers, I encourage every organization to should shift their frame of mind as to what can be achieved when we break down the barriers of Artificial Intelligence and leverage local talent.